Traditional Christmas celebrations have long included a variety of plants, many of which, like holly, ivy, yew, and fir, remain evergreen even in the harshest winters, a quality that made them symbols of prosperity and fertility in the pagan celebrations of ancient Britain and Europe, notably the winter solstice. One such evergreen plant was used by the Druids as a fertility symbol, and that association has carried through to the modern holiday custom of kissing under the mistletoe. Mistletoe seems a modest plant with its tiny white berries, leathery leaves, and sprawling stems (not much of a holiday decoration), but its habitat value is anything but modest. The name ‘mistletoe’ refers to plants with a unique lifestyle rather than plants that all belong to the same taxonomic grouping. There are some 1,300 species of mistletoe worldwide divided among three families: Misodendraceae, the feathery mistletoe family; Santalaceae, the sandalwood family; and Loranthaceae, the showy mistletoe family. As hemiparasites, mistletoes take only water and minerals from the host while photosynthesizing their own food. All mistletoe species share the parasitic strategy of entering their hosts from above ground rather than through the hosts’ roots. From there they colonize the tops of trees and shrubs and gain easy access to sunlight and pollinators. Recent research in Australia (home to the spectacular showy mistletoes) suggests that mistletoes are a keystone species, one that has an outsized effect on its habitat and without which the ecosystem is likely to collapse. Clumps of mistletoe provide both nesting sites and protective cover for birds, from tiny wrens to hawks. When the parasite’s infestation kills or weakens its host, it creates new spaces for cavity-nesting birds. The plants’ berries are food for many animals, and it is a larval food source for many butterflies and a source of nectar for both insects and animals. The mistletoe species that took hold in Victorian parlors at Christmas was European mistletoe, or Viscum album. In America, the most common mistletoe is Oak mistletoe, Phoradendron leucarpum. Interestingly, plastic mistletoe sold for home decoration at Christmas is modeled on the leaves of American mistletoe and not the European original. Mistletoe is a dioecious plant, with male and female flowers growing on separate plants. In both illustrations shown here, the plant habits are the fruit-bearing female. 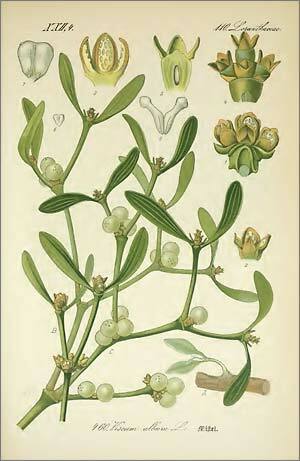 European mistletoe can be seen in an illustration from Flowers of Germany, Austria and Switzerland (1885) by Otto Wilhelm Thomé. 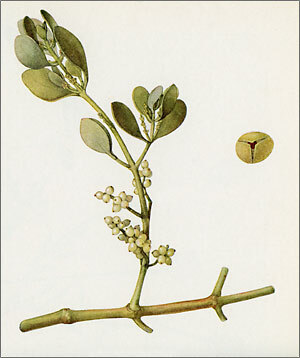 In this painting, there is a small illustration at the bottom right of a young mistletoe plant growing on a branch of the host plant. At the top right of the page, there is first a cluster of female flowers and a group of male flowers beneath. This appeared in the December 2016 issue of The Desert Breeze, the monthly newsletter of the Tucson Cactus and Succulent Society.